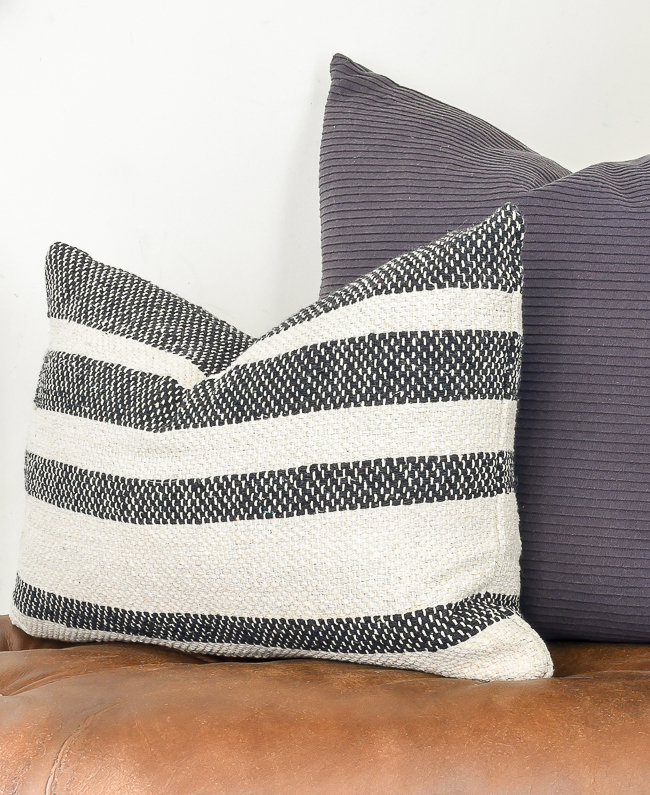 The easiest and most affordable way to create custom textured throw pillows. The other week, my daughter asked me to take her to Five Below so she could use a gift card. As she wandered around looking at earrings and squishies I eyed up the home decor, glancing up and down the aisles. I wasn't really seeing anything, but then down on a bottom shelf, I spotted a rolled up 3'x5' rug. 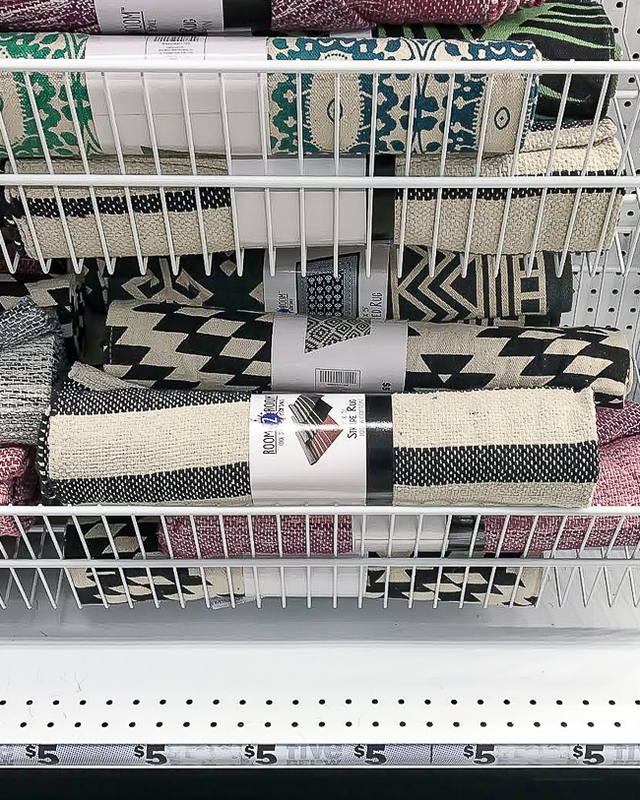 They had a variety of colors and styles, but I knew the black and creme striped rug would be perfect for DIY throw pillows for our home. The rug was thin, the weave gave it a nice texture, the colors were perfect and at $5 I couldn't resist the price. You can't even buy a yard of quality fabric for $5 and this rug was plenty large enough to make not one, but at least two throw pillows. 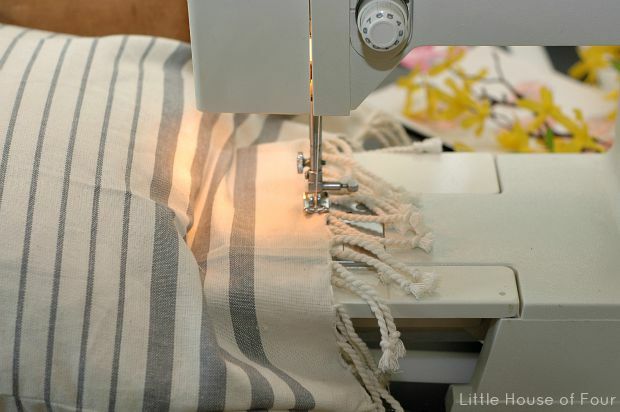 Don't worry if don't have the greatest sewing skills. 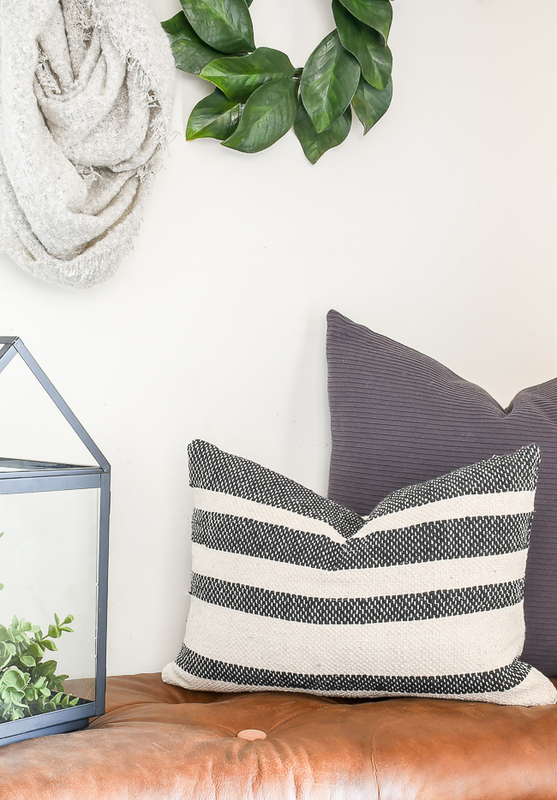 If you can sew a straight line and thread a needle than you can make this easy DIY pillow, I promise. 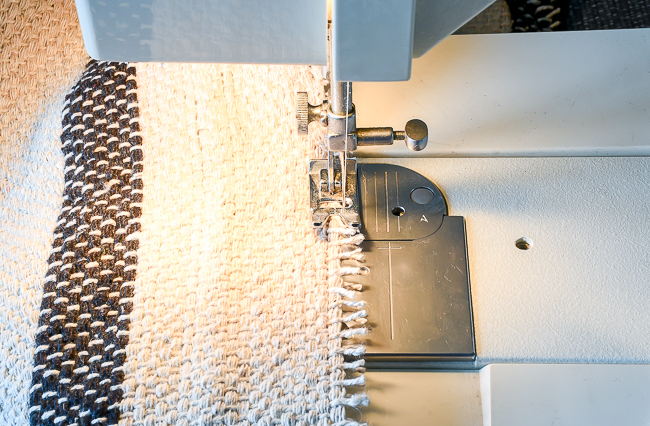 Measure and cut your rug to size, leaving at least a half inch for seam allowance on all four sides. I was able to fold my rug in half and only had to cut along the bottom and top of the rug. TIP: You want your pillow insert to be larger than your cover. 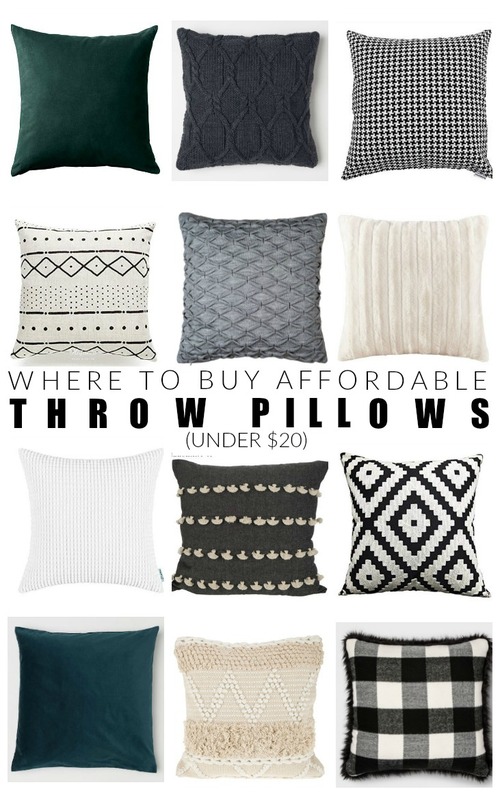 If you have a 20 x 20 down pillow then you'll want to make your cover 18 x 18. 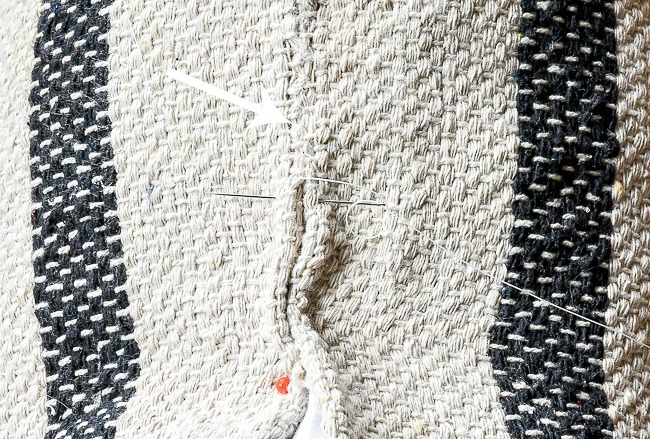 I mentioned a half inch seam allowance because the rug will unravel a bit and you'll lose some fabric. 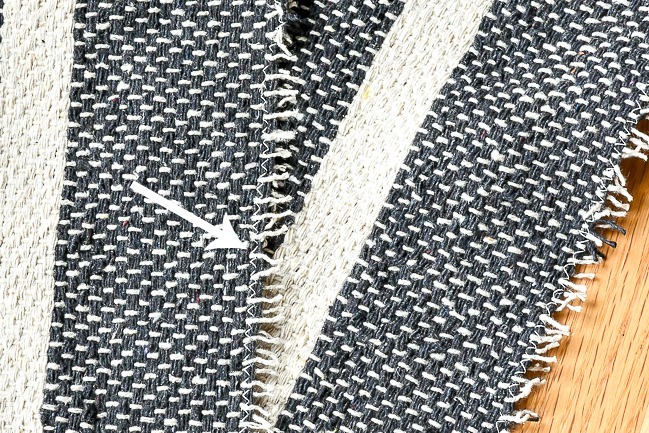 Once you have the rug cut, you'll need to serge the edge or add a zigzag stitch to prevent further fraying. 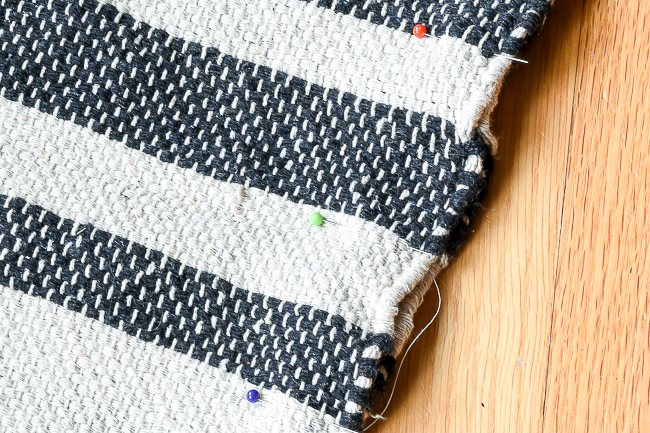 Once the raw edges of the rug are secure, lay the fabric right sides together, line up the pattern, secure with pins then hem along all four sides, leaving about an 8 inch opening in the MIDDLE of the bottom of the pillow. I placed my new $5 pillow in our mudroom then gave it a good fluff and karate chop. 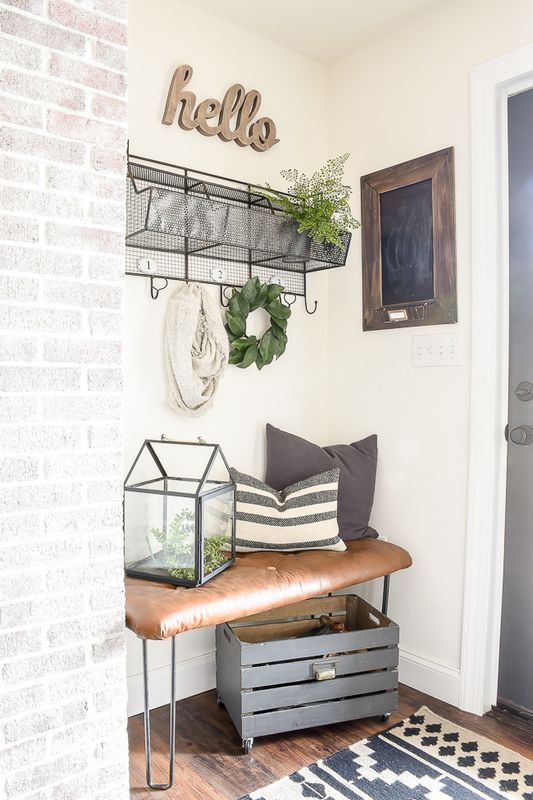 It looks great in this space, but I'm sure it will travel around our home since the colors and pattern are perfect for every room. 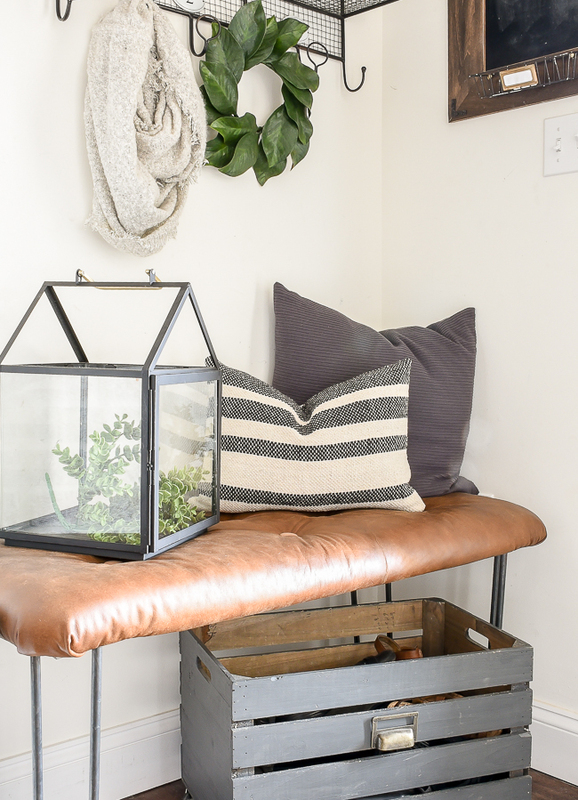 I mentioned before that throw pillows are one of my favorite home decor staples, so having ones that I can move from room to room is super important. I don't think I could have found a more perfect throw pillow with as much texture for less. This is the first time I've used a rug to make a pillow and you can bet I'm going to keep my eye out for more. 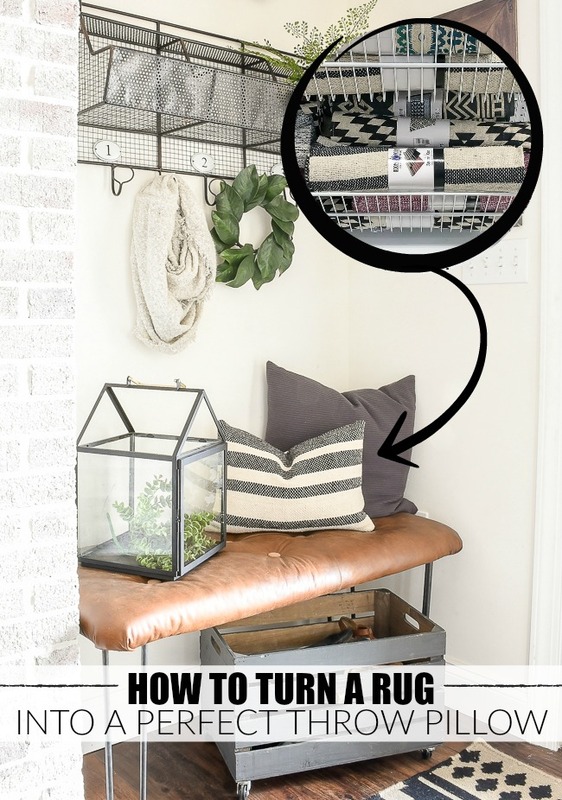 Placemats, shower curtains and table cloths also make great throw pillows, so be sure to keep your eye out for those as well. Awesome! You have a great eye to see potential! I seriously cannot wait to go to Five Below on Wednesday. I love this project, and I am hoping they have these! I love this but I'd put a zipper in it so it could be cleaned. Great idea! I love this idea!!! By the way, where did you find the box on the floor that is holding shoes and what was the box used for originally? I love that too!!! Thank you! The box came from HomeGoods, but I painted it Iron Ore, added caster wheels that I bought from Home Depot and a cool metal label holder.